The Indianapolis Colts defeated the Houston Texans, 21-7, in the Wild Card round of the playoffs. If you want to have a film watching session on how to start an NFL playoff game, Andrew Luck‘s first-half performance should be one of the few games viewed. It was nothing short of spectacular, as he was pinpoint with his accuracy with the only negative being a fluke interception off a batted pass. He cooled off a bit in the second half, but his play in the first put the game out of reach quickly. Much will be made of rookie left guard Quenton Nelson‘s pancake block of Jadeveon Clowney (he was tripped) in pass protection (pancakes in pass pro mean nothing), but his play in his first playoff game was shaky at best. Nelson was beat a few times in pass protection by Whitney Mercilus and also committed two penalties. The Colts’ secondary deserves recognition for their work on the back end of the defense. The Colts held All-Pro WR DeAndre Hopkins in check all game and did not allow a deep shot all game to go completed. The Texans were forced to check down for the vast majority of the game, and DeShaun Watson proved not to be accurate enough on Saturday evening. 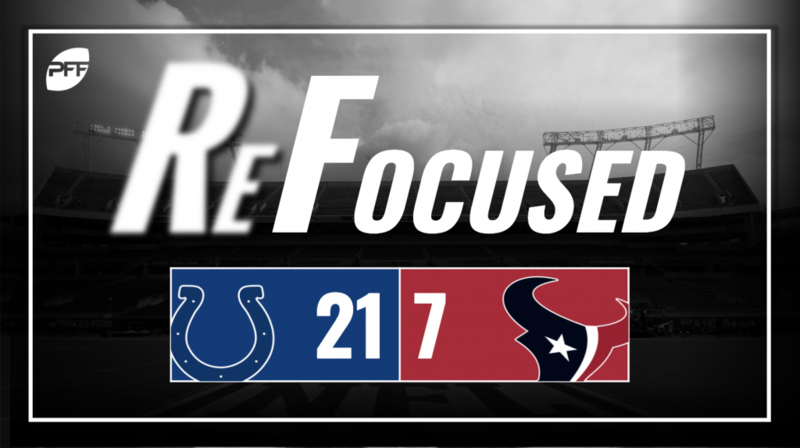 The Colts also shut down the running game for the Texans most of the contest. While Watson was able to get many rush yards due to his scrambling ability, the Colts took away the Texans’ running backs early and made Watson beat them with his arm. In his playoff debut, Watson was tasked with attacking the Colts’ soft zone defense. At the start of the game, Watson tried to beat the Colts over the top and later tried to force the ball to Hopkins. Watson had several throws that were right at defenders and were either dropped or intercepted. Watson was also not accurate enough at finding his receivers in the holes in the zone defense. About the only positive impact Watson had in the game was with his feet. One of the bigger surprises of the game was actually how well the Texans’ offensive line held up. The Colts do not have a daunting pass rush, but the Texans’ offensive line has been the Achilles heel of the team the whole season. The team’s front five held up enough for Watson in this one, but Watson didn’t deliver. J.J. Watt‘s game was a tale of two halves, as he looked unblockable in the first half while disappearing in the second. Watt had two batted passes, a couple of stops and several pressures in the first half, but he failed to record a stat in the second half while barely affecting Luck as a rusher. Cornerback Kareem Jackson came into the playoffs coming off one of the best seasons of his career, but he’s going to want to have short-term memory for this game. He was beat handily in coverage on a number of occasions and wasn’t able to make up for it, failing to break up any passes. Luck started the game on fire and coasted to victory in the second half, making enough throws down the stretch to seal the game.